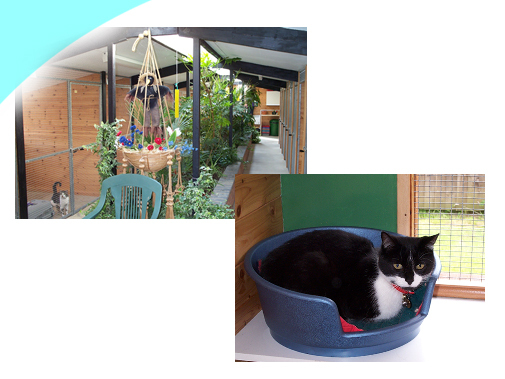 The cats are housed in individual chalets in a winter garden setting. In the summer it is wonderfully airy and shady as each chalet has its own openable window. In the winter these are closed but still allow the cat to look out. The building has background heating and we provide each cat with a heated bed. Cats from the same household are allowed to share and all our chalets are licensed for a minimum of 2 sharing - we have some chalets which allow up to 5 cats from the same household sharing. We have available a variety of different foods, both wet and dry, as well as fresh, but many owners like to bring along tidbits or home prepared supplements which we are happy to feed. Please ring for an appointment to visit or for further information.